In this step, you will test your Department & Employee Server by running the User Agent using the host configuration file you created in Step 9. 1. 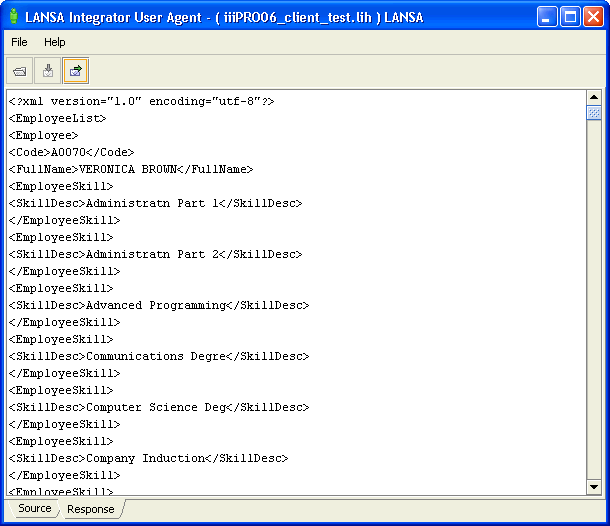 In the folder Server XML Employees Request open the User Agent using iiiPRO06_client_test.lih and send iiiPRO06_request.xml to the iiiFN06_SERVICE service on the JSM server. a. Double click iiiPRO06_client_test.lih to run the User Agent. Click File and select Open Source. c. Click File and select Send. Click Yes, then OK to confirm the completed transaction. The XML source has been sent to the server. 2. Verify that the server has sent the correct list of Employees and Employee Skills. The Response tab should have a large amount of text in XML format—each department has many employees, and each employee has many skills. Browse the response XML and check that it is correct. The iiiFN06 function, called by the iiiFN06_SERVICE service, has processed the iiiPRO06_request.xml and returned an appropriately populated version of iiiPRO06_response.xml. 3. You might want to try other valid Department codes. To do this, open iiiPRO06_request.xml and change the text to FLT or other desired test data. The Department Descriptions in the Response will change accordingly. Invalid Department codes should return a blank list.